A while back a friend of mine, Malathi Mahadevan (b/t), asked me if I’d like to do an interview for a book she was working on. I’ve been interviewed before but never quite like this. She called me up (on skype if I remember correctly) and we visited for a while. 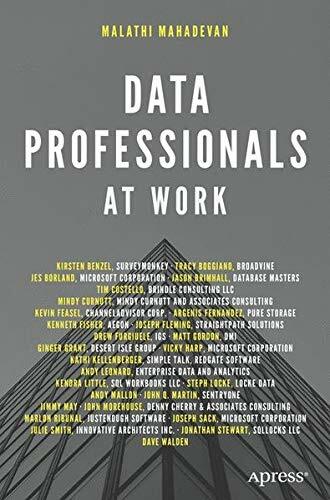 It was then transcribed, edited etc until we had a chapter talking about what it’s like to be a Data Professional At Work, which of course is the name of the book. It’s part of Apress Media’s “…At Work” series, and I’m a “Data Professional” so it kind of makes sense. Unfortunately, it turns out I do a much better job with written interviews than verbal. Fortunately, there are a bunch of amazing people involved in this project with lots of interesting things to say. Personally, I can’t wait to get my copy. Bonus! There will be a couple of book signings at PASS Summit this year. I won’t be there but a bunch of the others will be. Stay tuned for times and locations. Now, I’ll admit, a signing for a professional book may not seem .. well .. exciting. But it really is. I did one years back when I got bought my copy of SQL Server MVP Deep Dives Volume 2 and I had a great time getting it signed, and still have fun going back and seeing who signed it. If you get the chance take the time and do it. 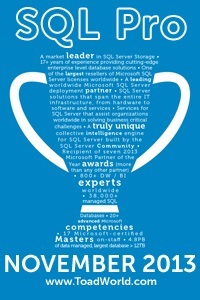 « How do I look at my error log if SQL won’t open? Cool! It’s in my Safari membership. I just added it to my bookshelf.